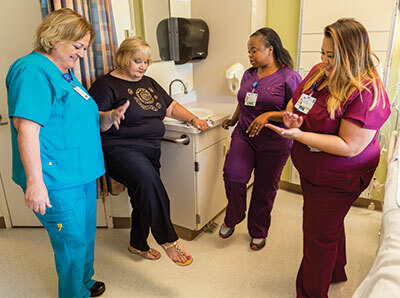 Cynthia Giaquinto, R.N., left, joins Susan Anderson-Seibert, R.N., and Joint Replacement staff members Nekisha Smith, restorative nursing assistant; and Elline Silva-Netto, R.N., to hear about Susan’s experience. When Susan Anderson-Seibert, R.N., of Vacaville, needed a hip replacement earlier this year, there was no question about where she would turn for surgery—the Joint Replacement Program at NorthBay VacaValley Hospital. A nurse at VacaValley herself, she knew first-hand the program’s reputation for excellent care and outcomes. Susan’s journey to hip replacement began with groin pain. As treatment, she underwent a series of cortisone shots, but the pain was never gone for long. Every patient is made to feel special and is treated with dignity and respect. I had an insider’s look, so I know it’s true. The turning point came one day at the end of her nursing shift. She sat down to rest, but got an urgent summons to a patient’s room. And she couldn’t get out of her chair. “That was it. When you need a nurse to get you on your feet, you have a problem,” she says. She consulted orthopedic surgeon Andrew Brooks, M.D., who diagnosed arthritis in her right hip joint. Then came the surprise: Dr. Brooks recommended that Susan have a hip replacement, but he wouldn’t do the surgery until she lost 50 pounds. At around the same time, her chiropractor approached her about a new weight loss program called Ideal Protein. She agreed to try it and in the following six months lost the 50 pounds. By the end of last year, Susan was ready for surgery. Her first step in the Joint Replacement Program was taking an educational class taught by Jennifer Larson, R.N. Jennifer became her pre-surgery nurse and prepared her for what was to come. Following her hospital stay, Susan spent two weeks at an inpatient rehabilitation center in Vacaville before returning home. At home, she had regular visits from a physical therapist to help her make a smooth recovery. “I did everything I was told to do because I wanted good results,” Susan says. “I feel so much better now; I would do it again in a minute. Since 2007, the NorthBay Joint Replacement Program at NorthBay VacaValley Hospital has offered an innovative system of care for patients seeking hip or knee joint replacement. The program focuses on education and preparation prior to surgery followed by comprehensive inpatient care designed to get patients back into the activities they enjoy as quickly as possible. Prior to surgery, patients attend a class, tour the facility and meet other people who will have replacement procedures on the same day. After surgery, the focus is on getting them up and walking, with friends or family members serving as “coaches.” The camaraderie of the small group of patients helps each of them on their road to recovery. Studies show that patients who recover as a team reach their goals faster with fewer complications. The NorthBay Joint Replacement Program is nationally accredited by The Joint Commission. It is also a member of the American Joint Replacement Registry—an independent, nonprofit database designed to store comprehensive data about joint replacement procedures to help physicians and artificial joint manufacturers improve the experiences of patients who undergo joint replacement surgery. For more information about the NorthBay Joint Replacement Program, call Cynthia Giaquinto, R.N., program manager for Orthopedics, at (707) 624-7600.